Pope Francis embraces Lucas Batista from Brazil as offertory gifts are presented during the canonization Mass of Sts. Francisco and Jacinta Marto. History was made at the shrine of Fatima at 10:30 a.m. on May 13 when Pope Francis declared that Francisco Marto and his sister Jacinta are saints. Francisco and Jacinta are the first child saints who are not martyrs in the history of the church. Francisco, Jacinta and their cousin Lucia are buried here side by side in the basilica. Before Mass, Francis prayed in silence at the tombs of the three shepherd children. When Jacinta’s body was exhumed before being brought here, 15 years after her death, it was found to be totally uncorrupted. Because of this, the local bishop asked Lucia, by then a contemplative nun, to write the memoirs of Jacinta and Francisco, detailing the extraordinary events that have so powerfully impacted the lives of believers ever since. Lucas Batista Maeda de Mourao, a ten-year-old Brazilian boy who was miraculously cured through the intercession of Francisco and Jacinta, was here for the canonization. Four years ago, he fell from the window of his grandfather’s home and suffered such serious brain damage. As his distraught father picked him up off the sidewalk to take him to the hospital, he invoked the intercession of Our Lady, Francisco, and Jacinta. That same night he and a local community of Carmelite nuns prayed to the two young seers to intercede with God to cure the boy. Some days later, to the amazement of the doctors, the young boy got up and walked home completely cured. Last February, the Vatican’s Congregation for the Causes of Saints concluded unanimously that his cure could not be scientifically explained. Francis recognized his cure as the miracle that opened the door to their canonization. 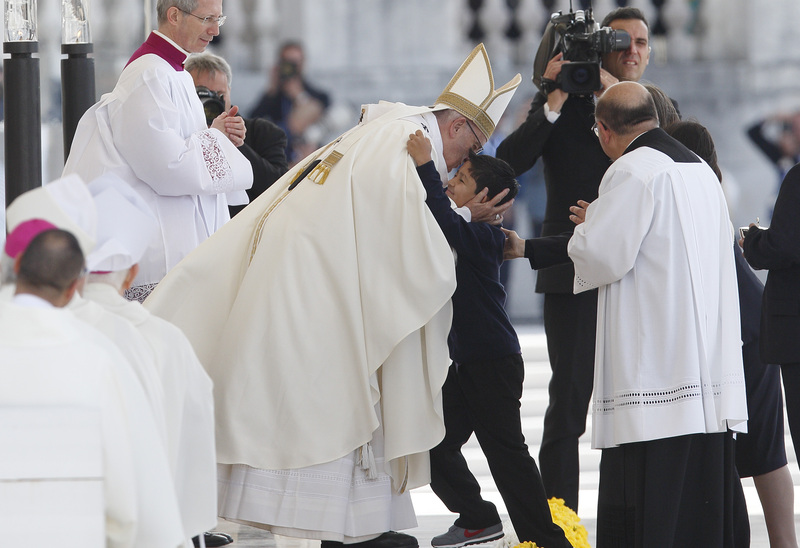 The pope embraced and kissed Lucas tenderly when he brought up the offertory gifts. He reminded those gathered that Our Lady introduced Sts. Francisco and Jacinta “into the immense ocean of God’s light and taught to adore him” and that this was “the source of their strength in overcoming opposition and suffering." Pope Francis referenced the secrets of Fatima and his own ministry at the canonization Mass. The message of Our Lady here one hundred years ago—calling for prayer, conversion, sacrifice and trust in God’s mercy—has lost none of its relevance for the 21st century. A day to rejoice. A day when the only battle that really matters becomes evident, that of salvation. Pray for us, sweet children of Fatima!